I like our chances against anyone with MA running the show. 30 years. You don't find that commitment and dedication in college football, let alone most other professions in today's world. The young men in that locker room will fight for him just as they fight for each other. Throw out records and stats, regardless of who stands in our path to Frisco, I know one thing, I am sure glad we have MA leading us into battle. Will we have instant replay next weekend? 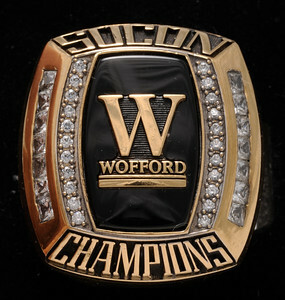 Or is it a Non-SoCon thing to not have it available? Watched both Samford and FU games and both had IR play a pivotal role in game momentum. Thx for the good wishes Cats! I keep hearing that Furman has improved drastically since September but I honestly don't see it. If they were so improved they would have blown out Elon who had lost a step since September. Meanwhile, they aren't the only team to improve since then; I doubt if we rematched Mercer, PC or Gardner Webb that those games would be as close. Rematches always fuel the losing team a little bit more. But this is a Ayers coached team.Its seldom his teams are not prepared or unmotivated. Furman has improved but so has Wofford. But this time we have the advantage of film study and hopefully a rested and full roster. Wofford has established an efficient and reliable passing game. If FU packs it in like Citadel then we have no problem relying on Goodson's arm. Defensively I am afraid of Blazejowski ability to run the ball more than his arm. I don't think we will come out with the vanilla defense we ran the first meeting. Any word on Horton, Clemmons, DW? Hope we have everyone available. I love that people keep believing the hype about Furman. Keep picking against us. I love having the chip on our shoulders. But at the end of the day, no revenge or redemption will matter, there is simple execution and getting the job done. I LOVE OUR SPOT. Bring them on into Spartanburg and let them get this playoff version of ourselves and see how much they like it. I watched the entire Furman / Elon game. I was not impressed. Was a good game from a competitive standpoint, but I saw all types of glaring weaknesses. Their defense we can exploit. On multiple facets. Both running the ball and passing. I do like their offense and QB as they are tough on offense. Good OL and schemes, and they play to win on offense, they take shots, and risks. But all in all this game will come down to fundamentals. Run the ball, STOP their run, win the turnover battle, defend #85 Tight End. Their primary passing weapon. WE WIN. No confirmation yet but i am hearing scuttlebutt we may see all 3 (Horton, Coco and DW) Saturday. Fingers crossed. Having Horton and Roo back will make a difference then throw in Coco and maybe DW too. Thank goodness for the bye week. Sure hope they can all go. I thought DW's injury was a mild one but I guess more than originally thought. Sure hope he is healed up by Saturday. Horton getting back out there would be huge. We've got to get some pressure on Blazejowski. Seems like that cat has been at Furman forever. I thought Datavious Wilson was being held out as a precaution? How's Roo's wrist? He broke it about 6 weeks ago? Any doctors could say something about it's healing/what kind of cast we can expect? YT I think Roo is good to go at 100%. He tweeted yesterday "Being sidelined for the opener against Furman hurt...the Big Man Upstairs is grinning now". Sounds like a player who is ready to go!